Kimbap is one of Korea’s most iconic snacks. It can be described as cooked rice, vegetables and meat rolled in gim (seaweed) sheets. Simply put, it is Korea’s version of sushi. There are differences between the two. First, Kimbap does not include raw fish. 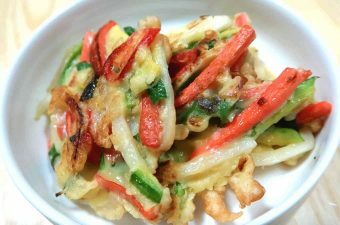 Instead, it is typically filled with Danmuji (pickled daikon), crab sticks (imitation crab meat) or other meats, cucumbers, carrots and rice. Second, Kimbap rice is not seasoned with vinegar. There is enough flavor from the mix of other ingredients. Nowadays, there are endless variations of Kimbap in Korea. Many people mix and match ingredients to their preferences. Here are some of the most popular variations of Kimbap in Seoul. Kimbap is also a very affordable meal – it usually costs 2,000 Won ($1.90) per roll. 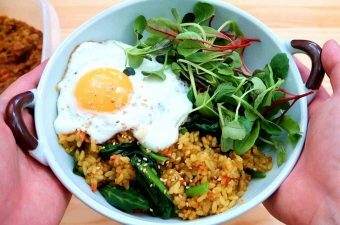 It is Korea’s version of ‘fast-food’ without the food-coma and the calorie bomb. In fact, you will see many street carts selling rolls for breakfast. As a side-note, I think Kimbap would be a good idea for a ‘fast-causal’ eatery chain in the US or Europe. Similar to eating at Subway or Chipotle, customers could pick their ingredients and have the roll made in front of you. Hmm – what do you think? 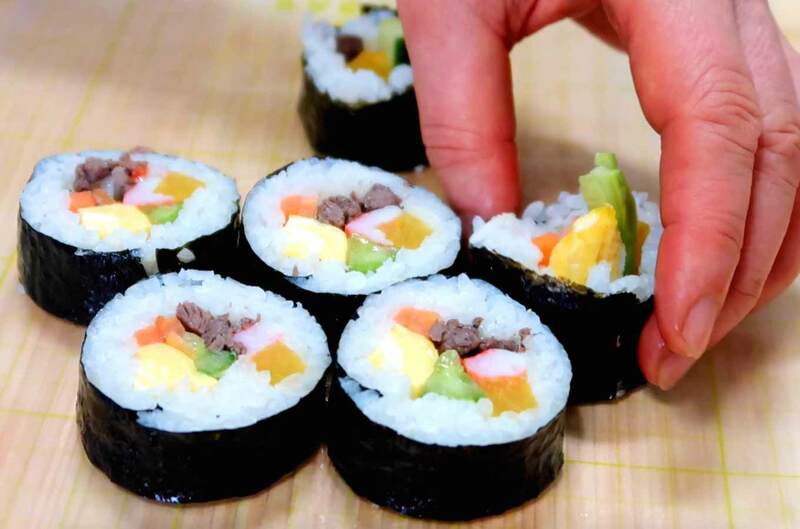 Kimbap is one of Korea's most iconic snacks. Cooked rice and a variety of vegetables are rolled in toasted seaweed sheets. It is Korea's version of sushi minus the raw fish. Pour two cups of rice into the rice-cooker bowl. Throughly rinse and wash the rice. Let it sit in cold water for 30 minutes. Then drain the residual water from the rice again. 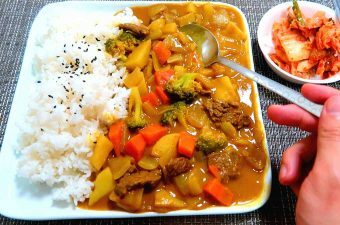 Use the same cup and pour two cups of water into the rice-cooker bowl. Place bowl into rice-cooker and turn it on . Let's start with the veggies: Cut off the ends from the cucumber. Cut cucumber into long strips (~1cm in width). Pour salt (1/2 teaspoon) and vinegar (1 teaspoon) over cucumber strips. Give a mix with your hands and let it rest for 10 minutes. Cut carrots into thin strips (0.5cm in width). Repeat the same salting (1/2 teaspoon) and vinegar process (1 teaspoon) for carrot strips. Then let's move over to the meats: Split the crab sticks in half with your hands. Take out a bowl and crack four eggs into it. Season the eggs with salt (1/2 teaspoon). Pour 1 teaspoon of water into the eggs. Mix eggs throughly and set aside for frying. Season minced beef with salt (1/2 teaspoon) and pepper. Take out the frying pan and cook the meat fully through. Pour out rice from the rice cooker into a large mixing bowl. Pour (1 teaspoon) of salt and (1 Tablespoon) vinegar over rice. Gently mix it into rice and let the rice cool down. Use a paper towel to squeeze out the extra moisture from cucumber. Place frying pan on medium heat. Put cucumber strips onto frying pan and cook briefly to remove moisture (roughly 10 seconds). Repeat the process above (step #2-3) for the carrot strips. Turn frying pan on a medium heat. 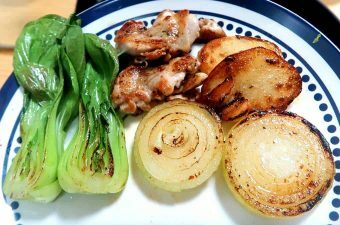 Pour vegetable oil into frying pan. Pour egg mixture in and give the pan a swirl so it is evenly coated. Wait until the egg omelette is half-way cooked, then begin to roll the egg. Cut the finished egg roll into long strips. Halve the strips until you get roughly 1cm in width. Put a frying pan on medium heat. Wait until frying pan is hot. 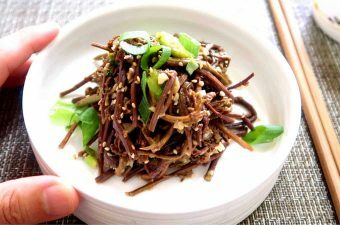 Place the gim (seaweed) sheet on the hot frying pan on each side for roughly 10 seconds. Repeat until sheets turn crispy and slightly green. Be careful not to burn them. Place gim on sushi mat. Check that the gim is close to the bottom of the sushi mat. Then pat down rice up to 3/4 of the gim sheet (or up to 1 inch from the top). Add the egg, carrot, cucumber, crab stick, beef and danmuji strips to the middle of the rice. Fold the kimbap (watch video for details). 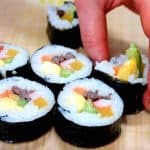 Use a brush to coat the gimbap with sesame oil. Cut the gimbap into circles. Making it at home will requires some time, especially for prep. I would recommend reserving a weekend and invite your children or significant other. Kimbap should be eaten in the same day as it was made. It will go bad if you keep it overnight.